This month’s Chord Clinic expands on the theme that we’ve been following over the last few instalments, namely the effect of mixing fretted notes and open strings in chord voicings. 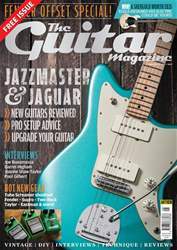 This month’s examples are almost all above the 12th fret, so you’ll need a guitar with a deep cutaway – we’re thinking more electric than acoustic in this session. Figure 1 kicks off with some high position Bsus4 chords, and a bassline outlining the classic I-V-VI-IV progression so frequently used in pop music. It sounds good strummed with a clean tone and plenty of down strokes, eight to a bar. Watch that you don’t hit the low E string when you are strumming that first chord, but muting the A string should happen naturally with the underside of the finger in the other three chords. The final chord is a bit of a stretch but it’s not too hard unless you are used to dangling the guitar somewhere down around your knees.